This brochure provides an overview of UNFPA’s role in addressing gender-based violence, an enormous impediment to sexual and reproductive health, as well as a major human rights issue. Recognizing that gender inequalities and their most brutal manifestation – gender-based violence – inhibit women and girls from accessing reproductive health services, and acknowledging that proper reproductive health care in the aftermath of a sexual violence incident can be life saving, UNFPA has assumed a leadership role in addressing this major human rights issue. 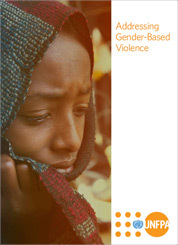 Incorporating examples of work in Afghanistan, Bosnia and Herzegovinia, Lao PDR, Malawi, Togo and South Sudan, this brochure shows how gender-based violence intersects with almost every dimension of UNFPA’s work, from meeting the need for family planning and disaggregated data to reaching out to young people and community leaders. Gender violence is a also serious public health concern that also impedes the crucial role of women and girls in development. The status of women and girls factors into virtually every one of the eight Millennium Development Goals (MDGs), which are now nearing their 2015 target date, with the most female-centric of them – maternal mortality – lagging the farthest behind.